This is the third part of the Photoshop tutorial. Previously, I wrote about several different types of photo editing solutions and opening, resizing and saving your images. This post will focus on how to combine two images to create a composite image. If you'd like to follow along with this tutorial, you may wish to download and install the free, 30-day trial version of Adobe Photoshop Elements 8. If you are using a Mac, you will need to download the software here. Let's start: we'll take an antique photo mat and put a photo in the middle. This will give us the skills to proceed with a more complicated project, like the Paris stencil on Norma's blog, Make Mine Mini (I'll cover a very similar looking project in a future post). The photo that we'll be using is a picture of Elizabeth Cady Stanton and her daughter, Harriot, which is in the public domain. Feel free to substitute it with a photo from your family album or collection. Let's begin by downloading the mat and the photo. Save them to your desktop. Open Photoshop Elements (or your preferred image editing software). Once the software is open, go to the top of your screen and choose File — Open. Locate the file "mat.jpg". Click the "Open" button. You'll see the photo of the antique mat on your screen. On the right side of your screen, you will see several boxes, or "palettes". We're going to use the "Layers" palette. If you don't see the Layers palette, go to the top of your screen and choose Window — Show Layers. Layers are one of the things that allow us to do so much in Photoshop. Think of layers as being like a sandwich - different graphics stacked on top of each other to make a yummy result. We will have 2 layers: the mat and the photo. Just like you are matting a full size picture, the photo goes under the mat, or in Photoshop, it is on the layer below the mat. Because they are on separate layers, we can edit them and move them around without affecting the things on the other layer. We will want to move our photo around a bit and perhaps make it larger or smaller inside of the mat without making changes to the mat. In the "Layers" palette on the right side of the screen, you'll see the "Background" layer is highlighted in blue. Double click on that layer. When the dialog box appears, you'll enter a new name where it says "Layer 0". Let's rename it "mat" and click OK.
Now we'll remove the cream color background inside of the mat so that our picture will show. On the tools palette on the left side of your screen, choose the magic wand tool (the 7th tool from the top). At the top of your screen, you'll enter "40" into the "tolerance" box. Click on the cream background inside of the mat. "Marching ants" will appear around the edge of the cream background to show you the selected area. If the ants go into the edge of your mat, make the tolerance smaller (try 32). If the ants don't go all the way to the edge of the cream area, make the tolerance larger (try 50). 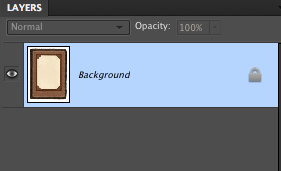 Now that the cream background is selected, we're going to remove it. Choose Select — Feather from the menu at the top of your screen. 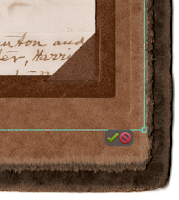 In the "feather radius" box, type "1" and click OK.
By "feathering" the edge of your selection, you are softening the edges of the area that you are removing. When you combine the two images together, they will not show a hard, defined edge where the 2 images meet. Now hit the "delete" key on your keyboard. You'll see that the inside of your frame is gray and white checks. The checks mean that the area is empty. It's ready for your photograph to be placed. 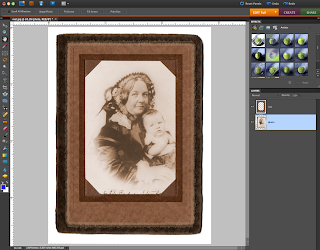 We're going to combine the antique mat with the photo of Elizabeth and Harriot. Just like you did before, you'll go to File — Open, and this time choose "stanton.jpg" from your desktop. When the photo appears, you'll choose Select — All from the menu at the top of your screen. The marching ants will appear around your entire picture. We'll do a simple copy and paste to get the picture of Elizabeth and Harriot into the mat. Go to Edit — Copy. Now, move or minimize the window with Elizabeth and Harriot so that you see the mat. You may wish to leave the photo as it appears, or you may choose to move it around in the mat; make it smaller or larger. 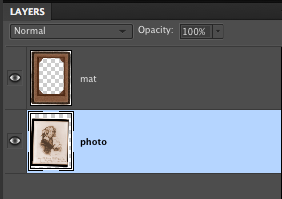 To move the photo around inside of the mat, you want to make sure that the "photo" layer is selected in the layers palette (like the example above). Choose the Move Tool, which is the 1st tool in the toolbox on the left side of your screen. You can click and drag on the photo to move it. If you would like to make the photo larger or smaller, click on one corner of the box that appears when the Move Tool is selected. When you are satisfied with the size, you can click on the green check mark as the picture below shows. Now you are ready to resize your picture and mat for printing at whatever size you choose. An easy way to do this is to choose the Crop Tool from the toolbox on the left of your screen (the 10th tool down from the top of the toolbox). In the boxes above your work area, you will enter a width of your choice (don't forget to specify "in" or "cm") and a resolution of "300" pixels/inch. Click on the top left corner of the mat and drag your box to the bottom right corner. When you are satisfied with your crop, click "enter". Your image will now be the size you specified. If you wish to preserve the mat and photo as separate layers so that you may make changes to it at a later date, choose the "Photoshop" format instead of a jpg. Make sure that the "Layers" box is checked at the bottom of the "Save As" dialog box. If you are satisfied with your picture, and will not make changes to it later, you may wish to save it as a jpg. Make sure that you choose the maximum quality setting (usually "12") in the "Save As" dialog box. The next part of the tutorial will cover creating a composite image using multiple layers to achieve interesting "Photoshop" effects. Your comments are always welcome! If you have any questions or suggestions on this tutorial, please let me know. Thank you so much for taking the time with these wonderful and terribly useful tutorials. I have always wanted to "layer" my pictures. You made it sound easy. I am going to try it out! I need to make loads of paper bags with vintage Indian ads :).